If you use an iPhone, you probably use iTunes. If you use Android, you use…well, what? A lot of people simply drag their media to the Android device like they would a flash drive. Other phones use the manufacturer’s own app, much like Samsung. But Android doesn’t have just one dedicated iTunes-like app to sync media between your computer and device. Rather, there are actually multiple apps that can do this, DoubleTwist being one of them. playlists can then even be moved over to iTunes if necessary (the same is true for Windows Media player on Windows). It has some trouble with DRM’d media, especially if you’re looking at movies and shows you purchased from iTunes. But it has no trouble playing media that is not copy-protected. But if this was all DoubleTwist did, it wouldn’t be much different from any other media playing/syncing app. On the top of the sidebar, you’ll find that you can use DoubleTwist to download apps from the official Android Marketplace, music and videos from Amazon’s online service, and podcasts from a variety of sources. The podcast list is not as extensive at iTunes may be, but the ability to have this is greatly appreciated. The addition of the Android Marketplace and Amazon’s services more than make up for this discrepancy. However, you can sync RSS feeds to download media, as well as a variety of media links through the main menu. Of course, DoubleTwist has it’s own Android app that is simply beautiful. It looks similar to the tiled interface of Windows Phone 7. It plays any of the media that is synced from DoubleTwist (I’ll explain more about this in a minute). The app also has the ability to stream internet radio, which I find very nice. I did find on occasion that the app would freeze up, but it seems to have gotten better in recent updates. Lastly, the apps sync with each other via your phone connection cord for free. But for $4.99 you can get the AirSync app to go with it. AirSync allows you to sync your media over wifi with your computer. It also allows you to stream your media to your Apple TV through AirPlay, and to other ANdroid devices that support near field communication. The system has some bugs though. The desktop app can be a little slow to launch after repeated use, and I wish they could open up the podcast repository a bit more. I also found that importing media via other methods (such as the drag-&-drop method) wouldn’t show up in DoubleTwist unless I manually searched for them through Android’s file browser. And as I said before, the mobile app still can be a little unstable. 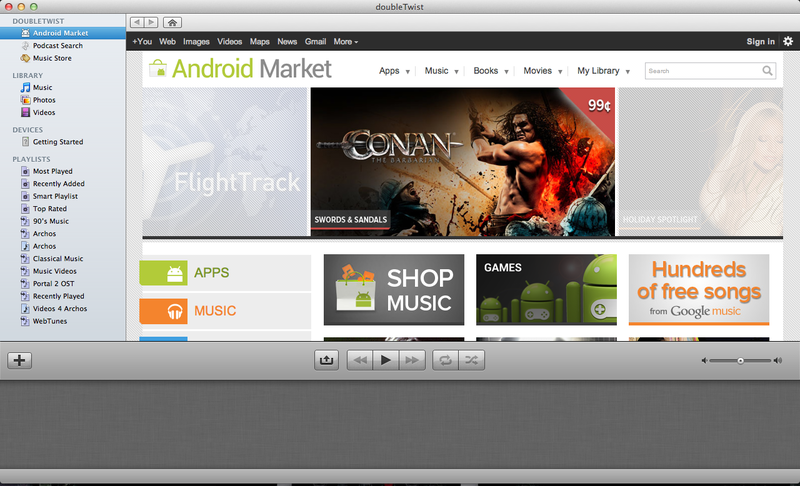 If you’re willing to have an iTunes like experience with your Android device, then give DoubleTwist a shot. It supports just about every Android device running Android 2.1 (Eclair) and higher, though it also supports most iOS devices. It also support Windows Mobile, Blackberry, PSPm Sansa media players, and more. It runs on Mac OS 10.5 and higher (Leopard and higher), as well as Windows XP and higher. And If you have any questions, comments, or suggestions about this or any other topic, leave a comment below or email me at easyosx@live.com You can also check me out on Facebook, Twitter, and YouTube by hitting the buttons on the top of your screen. You can also check out my Google Plus Page at https://plus.google.com/107817518299218190319. Thanks! True, but this was just one review. I might try out Winamp and review it in the future though. I didn’t realize they had a Mac beta out though.